Overview: More than 200 paintings, works on paper, sculptures, and printed materials focused on art created in the Parisian district of Montmartre at the turn of the 20th century. In addition to more than 100 works by Toulouse-Lautrec himself, works by predecessors and contemporaries such as Edgar Degas, Edouard Manet, Pierre Bonnard, and Vincent van Gogh also were on view, including posters by Théophile Alexandre Steinlen and Jules Chéret. The installation was arranged in 8 thematic sections: "Introduction to Montmartre," "The Typology of Montmartre," "The Moulin Rouge and Other Dance Halls," "The Chat Noir and Aristide Bruant," "The Cafés Concerts," "Stars of the Cafés Concerts," "The Maisons Closes," and "The Circus." An audio tour narrated by National Gallery of Art director Earl A. Powell III included commentary by guest curator Richard Thomson, curator Mary Weaver Chapin of the Art Institute of Chicago, and actor Joel Grey. Toulouse-Lautrec and Montmartre, a 10-minute film, was shown continuously in a theater adjacent to the exhibition. An expanded 30-minute version of the film was shown daily in the East Building Small Auditorium and intermittently in the East Building Auditorium. The film was made possible by the HRH Foundation. 3 Sunday concerts in March and April featured music by French composers in honor of the exhibition. A public symposium, "On the Place Pigalle: Art at the Heart of Montmartre," was presented on April 2. A film series, "Moulin Rouge, Montmartre, and Movies," was presented from March 27 through April 10. The showings included 2 silent films accompanied by live music. The exhibition was part of "Paris on the Potomac,"a citywide celebration honoring cultural ties between Washington and Paris. It inspired "A Taste of Montmartre," an offering of Parisian specialties on weekends in the East Building Terrace Café. 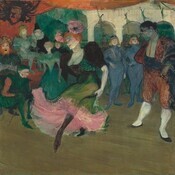 Organization: The exhibition was organized by the National Gallery of Art, Washington, and the Art Institute of Chicago. Richard Thomson, Watson Gordon Professor of Fine Art at the University of Edinburgh, was the guest curator. Philip Conisbee, senior curator of European paintings, and Florence E. Coman, assistant curator of French paintings, coordinated the exhibition in Washington. Sponsor: Time Warner Inc. was the corporate sponsor of the exhibition. The Catherine B. Reynolds Foundation was the foundation sponsor. The exhibition was supported by an indemnity from the Federal Council on the Arts and the Humanities. Catalog: Toulouse-Lautrec and Montmartre, by Richard Thomson et al. Washington, DC, and Chicago: National Gallery of Art and the Art Institute of Chicago, in association with Princeton University Press, 2005. Brochure: Toulouse-Lautrec and Montmartre, by Lynn Kellmanson Matheny. Washington, DC: National Gallery of Art, 2005.